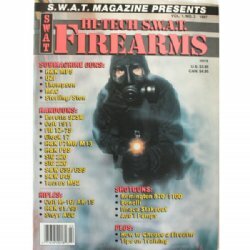 SWAT MAGAZINE PRESENTS: HI-TECH S.W.A.T. FIREARMS VOL. 1 NO. 2. SWAT MAGAZINE PRESENTS: HI-TECH S.W.A.T. FIREARMS VOL. 1 NO. 2. This magazine covers all the best pistols, shotguns and full-auto fun the 1980s had to offer. MACHINE GUNS: Colt AR-15/M-16, FN-FAL, FN-FNC, H&K 91/93, STEYR AUG, THE GALIL, M1A. SUB-GUNS: H&K MP5, Thompson, MAC, STEN, Sterling, UZI. SHOTGUNS: Remington 1100, Remington 870, Benelli, Stakeout Guns, Pump Shotguns.